Top ranked Al Shamal (8-2) recorded its second loss in Doha on Saturday night. Hosts were defeated by seventh ranked Al Ahli (3-7) 91-84. It ended at the same time the six-game winning streak of Al Shamal. Al Ahli dominated down low during the game scoring 62 of its points in the paint compared to Al Shamal's 34. They looked well-organized offensively handing out 24 assists. American Julius Coles (193-89, college: Canisius) fired a double-double by scoring 27 points, 6 rebounds, 11 assists and 5 steals for the winners. Guamanian-American guard Earnest Ross (196-91, college: Missouri, agency: Haylett Sports) chipped in 22 points, 6 rebounds, 6 assists and 4 steals. Algerian forward Mohamed Harath (198-90) produced 29 points, 9 rebounds, 4 assists and 4 steals for lost side. Al Ahli maintains seventh position with 3-7 record. Al Shamal at the other side still keeps top place with two games lost. They share the position with Qatar Club. Sixth-ranked Al Gharafa (4-6) made lots of trouble for third ranked Qatar Sports Club (8-2) in Doha. Qatar Sports Club managed to secure only two-point victory 75-73. However their fans expected easier game. Worth to mention a great performance of the former international center Mohd-Yousuf Mohmmed (204-82) who helped to win the game recording a double-double by scoring 13 points, 16 rebounds and 6 assists. Toney McCray contributed with 21 points, 10 rebounds and 4 assists for the winners. American guard Franklin Session (187-89, college: CS Los Angeles) replied with a triple-double by scoring 14 points, 13 rebounds, 13 assists and 4 steals for Al Gharafa. Qatar Sports Club have an impressive eight-game winning streak. They used an opportunity after Al Shamal lost their game and moved up joining them at the top position. Al Gharafa at the other side keeps the sixth place with six games lost. Very important is a road loss of second ranked Al Sadd (7-2) against ninth ranked Al Rayyan (1-9) on Saturday night. Visiting Al Sadd was crushed by Al Rayyan in Doha 80-59. It ended at the same time the two-game winning streak of Al Sadd. Lenny Daniel had a double-double by scoring 28 points and 13 rebounds to lead the charge for the winners. At the losing side Nasser Al-Rayes responded with 21 points and 6 rebounds. Al Rayyan maintains ninth position with 1-9 record. Loser Al Sadd dropped to the third place with two games lost. The game in Doha was also worth to mention about. One of their biggest challengers Al Wakrah (6-4) played at the court of fifth ranked Al Arabi (6-4). Al Arabi managed to secure a 5-point victory 74-69. It ended at the same time the two-game winning streak of Al Wakrah. Oumar Seck notched a double-double by scoring 22 points and 13 rebounds to lead the effort. Defending champion moved-up to fourth place, which they share with defeated Al Wakrah. 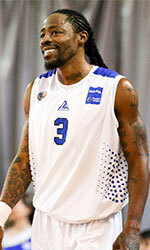 The best stats of 10th round was 27 points and 12 rebounds by DaQuan Brooks of Al Wakrah. Top ranked Al Shamal (8-2) recorded its second loss in Doha on Saturday night. Hosts were defeated by seventh ranked Al Ahli (3-7) 91-84. It ended at the same time the six-game winning streak of Al Shamal. Al Ahli dominated down low during the game scoring 62 of its points in the paint compared to Al Shamal's 34. They looked well-organized offensively handing out 24 assists. American Julius Coles (193-89, college: Canisius) fired a double-double by scoring 27 points, 6 rebounds, 11 assists and 5 steals for the winners. Guamanian-American guard Earnest Ross (196-91, college: Missouri, agency: Haylett Sports) chipped in 22 points, 6 rebounds, 6 assists and 4 steals. Four Al Ahli players scored in double figures. Algerian forward Mohamed Harath (198-90) produced 29 points, 9 rebounds, 4 assists and 4 steals and Georgian Mikhail Berishvili (204-87) added 21 points respectively for lost side. Al Ahli maintains seventh position with 3-7 record. Al Shamal at the other side still keeps top place with two games lost. They share the position with Qatar Club. Very important is a road loss of second ranked Al Sadd (7-2) against ninth ranked Al Rayyan (1-9) on Saturday night. Visiting Al Sadd was crushed by Al Rayyan in Doha 80-59. It ended at the same time the two-game winning streak of Al Sadd. Al Rayyan dominated down low during the game scoring 62 of its points in the paint compared to Al Sadd's 22. American Lenny Daniel (203-87, college: CS Northridge) had a double-double by scoring 28 points and 13 rebounds to lead the charge for the winners and international forward Abdelrahman Abdelhaleem (205-96) chipped in 21 points and 7 rebounds during the contest. At the losing side international power forward Nasser Al-Rayes (208, college: California Tech) responded with 21 points and 6 rebounds and international point guard Moustafa-Essam Fouda (174-97) scored 25 points. Al Rayyan maintains ninth position with 1-9 record. Loser Al Sadd dropped to the third place with two games lost. Sixth-ranked Al Gharafa (4-6) made lots of trouble for third ranked Qatar Sports Club (8-2) in Doha. Qatar Sports Club managed to secure only two-point victory 75-73. However their fans expected easier game. Qatar Sports Club outrebounded Al Gharafa 45-34 including 34 on the defensive glass. Their players were unselfish on offense dishing 22 assists. Qatar Sports Club brought some defensive toughness making 7 blocks. Worth to mention a great performance of the former international center Mohd-Yousuf Mohmmed (204-82) who helped to win the game recording a double-double by scoring 13 points, 16 rebounds and 6 assists. American forward Toney McCray (196-89, college: Nebraska) contributed with a double-double by scoring 21 points, 10 rebounds and 4 assists for the winners. Four Qatar Sports Club players scored in double figures. American guard Franklin Session (187-89, college: CS Los Angeles) replied with a triple-double by scoring 14 points, 13 rebounds, 13 assists and 4 steals and his fellow American import forward Nick Stover (198-93, college: S.Alabama) added 31 points and 6 rebounds in the effort for Al Gharafa. Qatar Sports Club have an impressive eight-game winning streak. They used an opportunity after Al Shamal lost their game and moved up joining them at the top position. Al Gharafa at the other side keeps the sixth place with six games lost. The game in Doha was also worth to mention about. One of their biggest challengers Al Wakrah (6-4) played at the court of fifth ranked Al Arabi (6-4). Al Arabi managed to secure a 5-point victory 74-69. It ended at the same time the two-game winning streak of Al Wakrah. They outrebounded Al Wakrah 43-31 including 34 on the defensive glass. Al Arabi players were unselfish on offense dishing 23 assists comparing to just 10 passes made by Al Wakrah's players. They brought some defensive toughness making 11 blocks. Senegalese center Oumar Seck (208-88) notched a double-double by scoring 22 points and 13 rebounds to lead the effort and the former international swingman Khalid Abdi (198-87) supported him with 14 points, 11 rebounds and 7 assists. Four Al Arabi players scored in double figures. Even a double-double of 27 points and 12 rebounds by American point guard DaQuan Brooks (177-90, college: W.Connecticut) did not help to save the game for Al Wakrah. His fellow American import power forward Joshua Caldwell (203-91, college: William Penn, agency: SDJ Sports) added 21 points for lost side. Defending champion moved-up to fourth place, which they share with defeated Al Wakrah.